Social activist Anna Hazare ended his 7-day-long hunger strike on Tuesday evening after around six-hour marathon meeting with Maharashtra Chief Minister Devendra Fadnavis. Union Agriculture Minister Radhe Mohan Singh also took part in the discussions at Hazare’s Ralegaon-Siddhi village. After the meeting, Fadnavis requested Hazare to break his fast, which the activist did by accepting a glass of sherbet from the chief minister amidst loud cheers by his helper and villagers. Before, Fadnavis and Singh discussed threadbare the 3-point demands raised by Hazare who launched the indefinite hunger strike on January 30. The demands were: implementation of Lokpal at the national level, establishing up Lokayuktas in all states and conceding the farmer’s demands through the M.S. Swaminathan Commission Report. 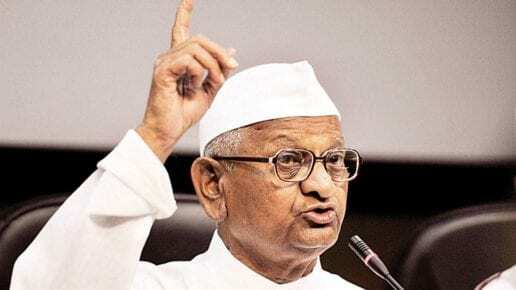 The government moved at top speed to appease the 81-year old Hazare after he lashed out at the ruling Bharatiya Janata Party (BJP) on Monday, accusing it of “utilizing” him to come to power in 2014. In wake of the statement, Fadnavis rushed to Hazare’s village from Mumbai on Tuesday afternoon to hold final talks with him and later announced that his demands have been met. “The process of appointing Lokpal will be initiated soon by the center. The Lokpal search committee will meet on February 13 as per the directives of the Supreme Court in the matter,” Fadnavisstated. For the Lokayukta in Maharashtra, as demanded by Hazare, a joint drafting committee has been set up to prepare a new bill on the matter which would be introduced in the upcoming Budget session of the state legislature starting later this month, he said, adding it would have representatives of the government as well as those nominated by Hazare. What is All India Radio?